When your garage is due for an improvement, look no further than Custom Garage Works! 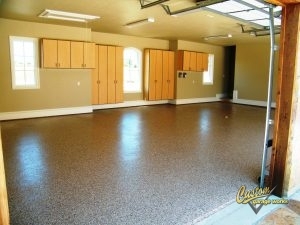 Back in 2003, we began by offering high quality garage floor coating in Frisco,TX. We wanted to create the perfect garage, and when we could not find what we wanted in the industry, we made the decision to create it ourselves. Now, we provide some of the greatest garage storage cabinets in the industry, as well as high quality polyurea polyaspartic floor coatings that last years longer than traditional epoxy floor coating. Our team is professional trained, and we are passionate about creating custom garages, with impressive garage floor coating results across DFW. 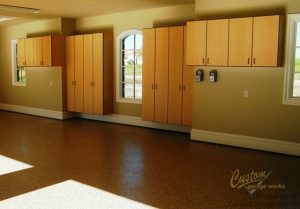 Out of all of our services, our most common services is our polyurea polyaspartic floor coating in Frisco, TX. This boom in popularity is probably because our coatings are more durable than epoxy, and cure in a shorter amount of time, which means that you can use your garage within 24 hours in most cases. While with epoxy floor coatings, you need to avoid UV exposure and watch out for flaking, our polyurea-based floor coatings are significantly more durable. Since we choose to use a diamond grinder to prep the floor for coating, as opposed to acid etching, we can ensure a higher quality end result. To schedule your free estimate, and to discover more about our garage floor coating options, contact us at 214-494-9068 or 817-308-1305! Garage Floor Grinding By using diamond grinding instead of acid etching, we can apply a stronger, more durable coating that will work for years. And More! If you would like to learn more about the services we provide, you can check them out here! When you decide on a storage solution from Custom Garage Works, you never need to shuffle through mountains of clutter in your garage again. The greatest custom garages have an organization method in place. To meet the unique organizational needs of our customers, we offer a variety of different organization solutions, including overhead storage racks and cabinets. Designed specifically for garage use, our garage cabinets are among the best in the industry, and our storage racks are made for heavy duty storage. If you need a reliable garage floor coating in Frisco, TX, and unmatched organization solutions, you can depend on Custom Garage Works. Car Lifts A residential garage car lift is simpler to operate than you may think! And More! Do not be concerned by clutter in your garage any more. We have the organization solutions you requires!